Sebastian Vettel says Ferrari was surprised by how long Pirelli’s Formula 1 tyres could last in the Canadian Grand Prix, after he lost out on victory to Lewis Hamilton. Vettel stormed into the lead at the start of the race, getting the jump on both Mercedes drivers as the lights went out. But with Ferrari believing a one-stop race would not be possible, Vettel pitted early for a middle stint on super-softs before taking the mandatory soft compound, while Hamilton made a one-stop race work to win. 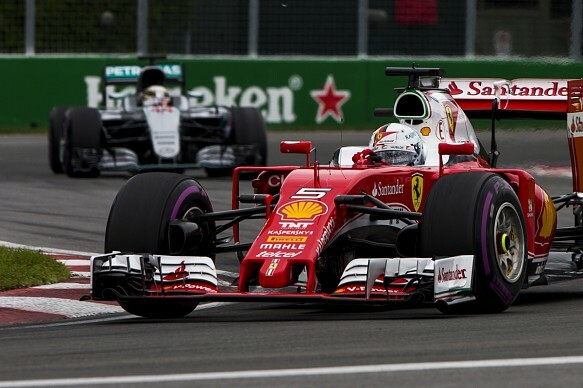 Speaking about two-stopping, Vettel said: “That was the plan – we committed fairly early. “It was probably the right thing to do in terms of getting to the checkered flag the quickest way. We lost track position – we didn’t expect the tires would last so long. Vettel also dismissed comparisons to the Australian Grand Prix , where Ferrari’s tire strategy during a red flag period cost him victory. “[The comparison] is not true – in Australia, with hindsight, you do a different strategy,” he said. “[Today] we committed early hoping the virtual safety car [which ended as he pitted] gives us an advantage and makes a two-stop favorable. “I will always defend our strategies. Others favored two stops [as well], with hindsight maybe they would do it different. Put yourself on the pitwall, to make that decision is tricky.